To Book: Enter information, then click "Book Now"
Experience thrilling whitewater rafting near Eugene & Sisters, OR! Trips meet at 9:45 AM in front of our McKenzie River office, located at Belknap Resort and Hot Springs, unless special arrangements have been made to be picked up or to meet at the boat launch. It is only a 50 minute drive from either Eugene or Bend Oregon. After the initial paperwork and introductions have taken place, we pile into our vans and head up to the boat launch. Having our office at Belknap Resort gives you the advantage and increased security of leaving your car here rather than on the side of the road at the boat launch or at a campground. Once we reach the boat launch, we provide everyone with all necessary paddling gear. This includes splash tops (a nylon top with neoprene wrists and neck cuffs), splash bottoms, wet suits and booties. These are provided on cooler days or by request and free of charge. After a thorough safety and equipment orientation, we launch and begin our adventure. This is usually about 30 to 45 minutes from the time we meet. 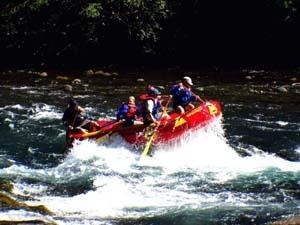 We work as a team on the river maneuvering our way through fun continuous rapids and old growth forests. You'll have the opportunity to engage in fun water activities such as water fighting, river games and of course the entertaining experience with your guides. You may also encounter Osprey and Blue Herons fishing along the way. The river is crystal clear the entire way, full of history and is a diverse river eco-system. All of our guides are well versed in the river history, flora and fauna. Most of High Country’s guides are local to the rivers they guide! On our full day rafting trips we offer a wonderful and hearty lunch, served and prepared by your guides right on the riverbank. High Country Expeditions prides itself with serving the best and most scrumptious lunches. Some of our guides are well trained gourmet chefs. Our lunches are always available to be customized to your needs. We can accomodate you needs whether you are vegetarian, vegan or on a low carb. diet, just let us know ahead of time. The trips are approximately 20 to 22 river miles long depending on water levels. You will get off the river sometime between 4:00 p.m. and 4:30 p.m. After the trip we load the gear onto our trailers and take you back to Belknap Resort and Hot Springs. At Belknap you can soak in their wonderful and relaxing 100+ degree Hot Springs Pool ($7.00 per person), walk beautiful and lavish flower garden trails and browse our store for souvenirs, including maps, books, shirts, hats and much more. And the resort is only 50 minutes away from beautiful Eugene or Bend, so it's perfect to visit these great Oregon cities! Full-day trips include a delicious 3 course riverside lunch served by your guide. 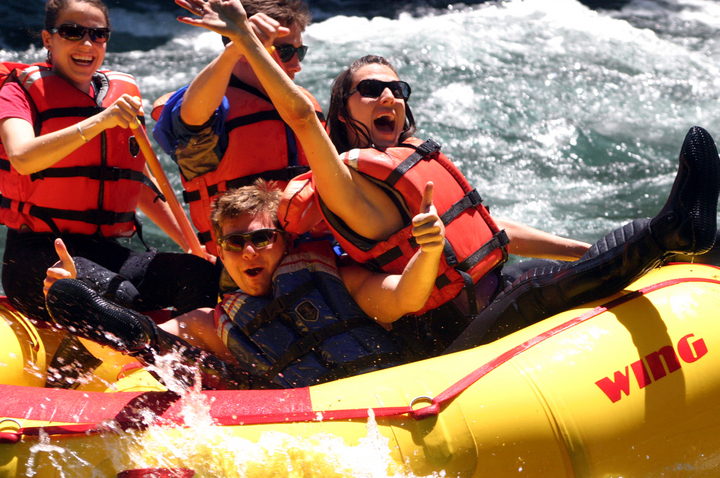 McKenzie River Rafting trips, McKenzie river family rafting trips near Eugene, Bend and Belknap Hot Springs Oregon. 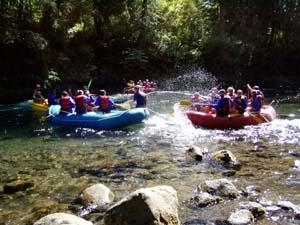 McKenzie River Whitewater and Upper Klamath river rafting trips on Oregons best rafting rivers. The full day 22 river mile McKenzie river rafting trip is a exciting day long adventure for all. It is perfect for small and large groups, kids and veteran river folk alike. This trip launches at the same location as our morning 1/2 day trips and continuous on all the way to Forest Glen located outside of Blue River. The adventure includes a wonderful guide served 3 course riverside lunch. Generally catering to all dietary needs whenever possible. meandering through dancing continues rapids on the upper stretch, passing along old flood laid log jams, at time "surfing" at Redsides (a famous kayakers play wave) . A wonderful day spent on the picturesque and exciting Upper McKenzie river. All trips meet at & return at one of our three per-designated McKenzie River locations. In McKenzie Bridge, by our new office located now at the McKenzie General Store complex or at the upper overflow parking area of Belknap Resort and Hot Springs.